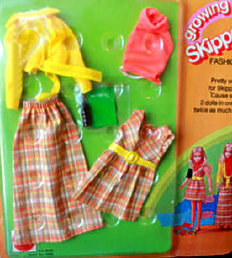 In 1975 and 1976 Mattel released two interesting and controversial dolls; #7259 Growing Up Skipper and #9222 Growing Up Ginger. 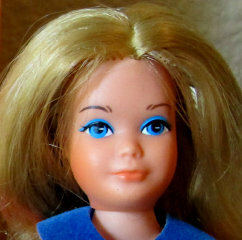 Both dolls had blue eyes and the ability to grow from 9 inches tall (9 ¼ inches was the height of the original Skipper) to 9 ¾ inches in height simply by turning her left arm all the way around counter clockwise. As you turn her arm her breasts would develop as well. To return to a little girl, merely turn her arm all the way around clockwise. Growing up Skipper debuted at the New York Toy Fair in February 1975. The box she’s packaged in reads; “2 dolls in 1 for twice as much fun!” She went from a “cute little girl” to a “tall, curvy teenager”, according to the packaging. Once she was for sale in stores newspapers all over the country had a heyday writing articles about this “Super Teen Skipper”. Mattel received numerous letters from women’s groups and parents complaining about the doll and her ability to grow breasts. In 1975 she had pale blonde colored hair, and when the 2nd version was available in 1976 she had slightly shorter, golden colored hair. In 1976, the brunette Growing Up Ginger was offered as well. She was only available in 1976, which makes her much harder to find on the secondary market, and especially in the box. They are marked: #7259 Growing up Skipper: © 1967 Mattel Inc. Hong Kong U.S. & For. Pat. and Growing up Ginger: #9222 ©1967 Mattel, Inc. Hong Kong U.S. & For. Pat.